HOW DOES SUPER ENGINE CONDITIONER WORK? It cleans intake valves which are essential for efficient operation of engine. Deposits form on the intake valves over long period of engine-operation (more than 20,000km). These deposits can adversely affect the efficient flow of the air-fuel mixture into the combustion chamber which can affect economy and lead to reduced power and acceleration. It cleans dirty injections which are essential for efficient metering fuel flowing into the engine. Fuel injectors are designed to accurately meter fuel to the combustion chamber. The fuel passages are small and therefore they tend to have deposits piled up in the critical region where the fuel metered. Dirty injectors result in poor combustion of fuel and thus deliver poor vehicle performance. Shake the can well before attaching the nozzle. Position the nozzle directly at the flap of the "butterfly" valve and spray it for 30 seconds. In case of E-Throttle. DO NOT touch the flaps of the "butterfly" valve. 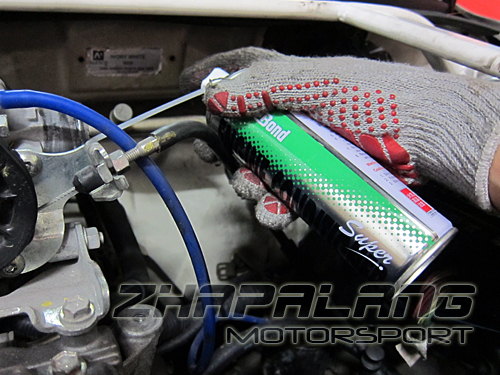 Restart the engine accelerate up to 2000rpm while spraying the remaining into the "butterfly" valve.